Imagine that you’ve just finished setting up your new warehouse. You’ve done your research: you know your expansion plans, you know your current and target markets, you know how the goods/services you sell can affect what the best place to put a storage unit would be, and you’ve found the perfect location that suits all your business needs. 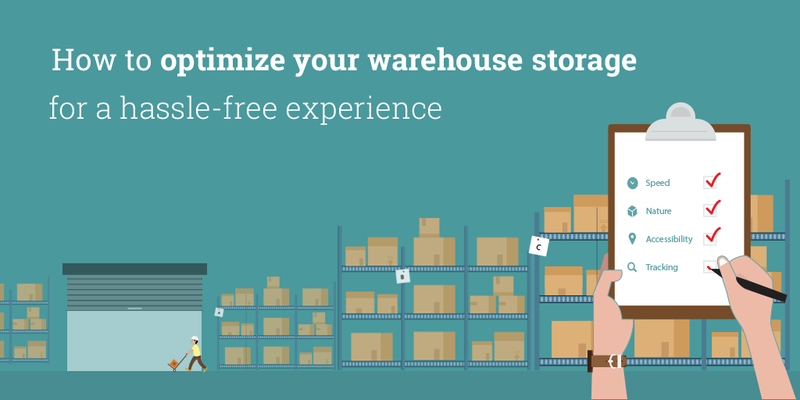 Now that you’ve got your warehouse, you need to know how to run it. What does it take to manage a warehouse? What kinds of tasks do you need to keep track of in order to make sure it all runs smoothly? Warehouse management in its essence, translates to the efficient management of the available space and time to operate your inventory. In order to optimize your use of space and resources, items and equipment must be stored in such a way that mirrors the sequence of your warehouse workflow processes. The goal here is to ensure better control over the movement of materials, people, and traffic without interruption, so that cross-flow clashes can be kept to a minimum. Organizing items based on movement and relevance. Implementing measures to minimize storage hazards. Improving item picking efficiency with locator systems. Understanding the benefits of having a flow compatible WMS. fruits, vegetables and dairy products > general provisions such as wheat flour or ketchup > cosmetic products like body sprays and talcs > household articles like towels and mops. When it comes to the arrangement of items, from the customer’s point of view, they’d prefer to find the fast-moving items without having to walk the entire length of the store. This also makes sense from the storekeeper’s point of view, as it is much easier for workers to restock the items that are closer to the front end of the store as soon as they receive goods from vendors. This same principle applies to the items in your warehouse: it is more efficient to store seasonal and popular items in easily accessible areas–for example, near loading bays for easy picking and storing–and off-season items in less accessed sections of the warehouse. In certain cases, the same item can come in different sizes. When this happens, slots of various sizes will be necessary to store all of these. Larger, fast-moving items need bigger slots that are easy to access. However, this would mean that comparatively slow-moving, smaller objects would have to be placed farther into the warehouse. Hence, to optimize your picking cycle, you should aim to strike a balance between movement and size in which the smaller, fast-moving items are placed near the loading bays, while the faster and larger items can be stored in slots closely behind the smaller ones. Additionally, it’s important to consider items you have that are frequently bought together. Placing them as close to one another as possible can help you reduce the time spent finding and picking them. Inside a warehouse, safety must always be your highest priority. To understand this better, let’s go back to the supermarket example, where we not only come across items with different life cycles, but also with different properties. Some types of items are flammable or corrosive in nature, including cooking oil, sanitary cleaners, etc., while some are perishable and prone to contamination when not under controlled conditions. In a well-organized supermarket, items like bathroom cleaners and bleaching agents are kept as far away as possible from edible products, so as to avoid any chance of contamination due to a spill or leak. This same practice applies when it comes to storing flammables such as oils, wax candles, etc., and combustible substances like paper and other stationary supplies. Warehouses follow similar safety standards when it comes to storing items that are reactive. Hazardous items have to be isolated and stored away from items that can possibly react with them. When storing corrosives and chemicals, always check the Safety Data Sheets provided by the manufacturer carefully and adhere to them. Install safety labels and make it easier for your personnel to identify zones that contain hazardous material with the use of reflective markings and panels around them. Make sure that the safety equipment of your warehouse such as the fire fighting systems (sprinklers, hydrants, etc. ), ventilation systems (blowers and isolation covers) and spill control mechanisms (drainage sinks, insulated holding trays, etc) are accessible and operational at all times. They will help you save lives and reduce the damage to property in the event of a compromising incident. Imagine a busy day, with a large influx of orders of varying priority levels. To fulfill these, items will be picked from their slots and moved to a sorting facility within the warehouse where they will be packed and prepped for shipping. This process can be tiring even for an experienced employee who is familiar with every item’s location, as the process of sifting through the products to find the right one can be complicated and tedious. But with RFIDs on your items, these tags will communicate with an electronic reader that will detect every item inside every box or cart and read them almost instantly. Radio Frequency Identification tags, or RFID for short, are intelligent barcodes that can communicate with a networked system to track every product, whether it’s on a shelf inside your warehouse or a shopping cart at a retail outlet. While predominantly used to track cattle in the past, this technology is now gaining favor with manufacturers who want to track the location of each product they make, from the time it’s made until it’s pulled off the shelf and sold. This allows them to study their product movement so that they can tailor their production and distribution operations, cut costs, and handle returns better, all according to the flow of their current products in the market. RFID tags can also be applied to items in a warehouse. Depending on the type and quality of the tag, an item picker can locate and read items from as far as 100meters. This saves a lot of time over the conventional method of sifting through the lots to find the right lot with the required item. On top of increasing the item detection range over traditional tagging systems, more information, such as secondary product codes, can be stored on RFID tags; the read-write type of RFIDs even allow the data to be modified or overwritten if necessary. This comes in handy when you are reallocating product SKUs or renaming certain items. While spreadsheets may be sufficient for managing storerooms, it is important to have a WMS (Warehouse Management System) that is compatible with your business practices to catalog your items and track your stock movement. For instance, if you are a drop shipper who maintains a virtual inventory, then your WMS must allow you to mark customer sales orders for drop shipments and track vendor fulfillments. These systems not only record data related to your items and transactions, but they also can generate reports of various focal points as needed. For instance, by specifying a time frame, you can generate inventory summary and valuation reports that can show you the item quantities across various phases of their life cycles and their asset values. This allows you to identify the inventory turnover rate, reduce the number of slow-moving items in your care, and free both space and capital for your fast-moving items. Additionally, these systems can be integrated with your accounting platform or shipping service provider to help you minimize the effort spent on fixing duplicate transactions and correcting data entry errors. While a conventional WMS allows one to record SKUs, monitor item statuses, and track stock flow, they are tied to one physical location and require more manual intervention, including having to access reports by hand and send them off to sales teams, installing upgrades, and so on. Due to the ever-changing needs of consumers, cloud-based order management systems are becoming the medium of choice for businesses, largely because of their ability to track inventory and cash flow from multiple locations across multiple channels. Because they can operate and monitor sales, purchases, and projects from literally anywhere, they enhance collaboration between teams while offering more control over sales, purchases, and customer grievances. invest in a warehouse management system that best suits your business workflow. Be sure to keep an eye out for the next article, where we will be discussing the areas of order management that are often deal-breakers and how we can transform them into deal-makers. Fulfill orders more efficiently. Try Zoho Inventory Today!